Artist's impression of JIMO in the Jupiter system. Jupiter Icy Moons Orbiter (JIMO) was a proposed future NASA mission to orbit three of the large moons of Jupiter and conduct lengthy observations of these objects. JIMO could be one of the first deep space probes to have a nuclear power system, designed and developed as part of Project Prometheus. With unprecedented levels of electrical power available, JIMO would be able to study each moon in turn for long periods, enabling it to settle such important questions as whether these bodies do indeed have sub-surface oceans. It would also be possible to map the location of organic compounds and other chemicals of biological interest, determine the thicknesses of ice layers, with emphasis on locating potential future landing sites. As it leaves Earth orbit, JIMO will unfurl a series of heat-radiating panels designed to prevent the spacecraft from overheating. Then it will begin its six-year-long haul to Jupiter. Shortly after entering Jovian orbit in 2018, JIMO's trajectory will take it close to Callisto. Five months later, a prolonged burn of JIMO's ion engine will liberate it from Callisto's gravitational grip. 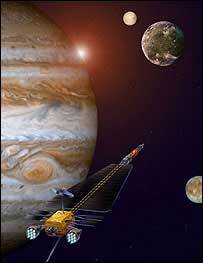 As it loses orbital energy, the spacecraft will fall towards Jupiter, to encounter its next target, Ganymede. Its final port of call will be Europa – the highlight of the mission and its most perilous aspect. Europa is in a more intense part of Jupiter's magnetosheath and the radiation is extreme. Despite precautions, such as the radiation hardening of its electronics, JIMO cannot be expected to operate for very long around Europa. It will carry a radar for mapping and determining the thickness of the enigmatic moon's ice crust, a laser altimeter to produce surface profiles, cameras and devices to measure magnetic fields as well as gas and dust. But all too soon Jimo is expected to be crippled beyond repair by the radiation. It, like the Galileo spacecraft, will be disposed of in Jupiter's atmosphere. Hopefully, however, the next mission should be well advanced by then and ready to take its place. This would have the capability to land on Europa's icy plains and melt a small sample of ice to look for signs of life. One of the unusual requirements of the probe is that it will have to jump from moon to moon. This will require far more energy than for any previous craft, and the only feasible power source is an on-board nuclear fission reactor to drive an electric propulsion system. The extra power will allow the use of instruments which normally can't be deployed in space because they need too much energy. As a comparison, the Cassini probe has a small plutonium unit, with a total power output of 900 watts for the craft's entire suite of instruments. JIMO will have a kilowatt of power available for each individual instrument. In May 2004, NASA issued its mission design requirements for JIMO to three industry teams. These requirements were the first product formulated by NASA's new Office of Exploration Systems in Washington. The Request for Proposal was released to the three previously qualified industry teams led by Boeing, Huntington Beach, Calif.; Lockheed Martin, Denver; and Northrop Grumman, Redondo Beach, Calif. These three companies were already working under study contracts investigating conceptual designs for the mission. The proposals are due July 16, 2004. The scope of the initial contract is to codesign the spacecraft through the preliminary design with the government team. A contract modification will be issued after preliminary design to implement the design, to integrate and test the spacecraft and to integrate the spacecraft with the reactor module and mission module. JPL would be responsible for delivering the mission module, which would include instruments procured competitively via a NASA announcement of opportunity. The launch vehicle will be supplied by NASA. The Department of Energy's Office of Naval Reactors would be responsible for the reactor module. To ensure the technologies demonstrated are consistent and coordinated with the Vision for Space Exploration, Project Constellation is managed within the Office of Exploration Systems.